Review: Kendrick Lamar, Damn. Tour, Sydney (Night Two). A Pulitzer prize. Curating the Black Panther soundtrack. There’s no denying it has been a big year for Kendrick Lamar. Following his Hottest 100 win at the beginning of 2018, an Australian tour was inevitable. As well as the Splendour in the Grass festival, Lamar took his DAMN. tour to Perth, Melbourne, Adelaide and Sydney. Never one to just ‘play the hits’ the second night of the Sydney tour saw Lamar dig deep into his back catalogue. Seeing Kendrick Lamar live is a cinematic experience. 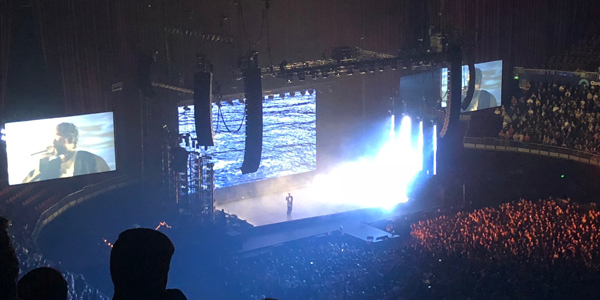 Throughout the concert, a series of short film interludes similar to the 1970s Kung Fu TV show treated the Sydney audience to the journey of “Kung Fu Kenny”. Production values were high, with pyro, smoke machines, a trap door on stage and a stage that elevated with Lamar standing on it. The concert also drew attention to the plight of African Americans killed by police, a theme that Lamar’s music explores. Throughout the concert, and in Lamar’s lyrics, he mentions that nobody is praying for him after his grandmother passed away. Uniting Church members should take this up, if only to pray that Lamar returns to our shores.